An Aquatic Mammal Digimon that grew fins on its hands and feet in order to paddle through water. It is more suited for life in the water than on land, and although it swims about quickly in the water with its fins and sturdy hind-legs, on the ground it moves about with weak, frog-like hops. When on land it has a very timid disposition, but when in the water it displays its natural, ferocious personality. 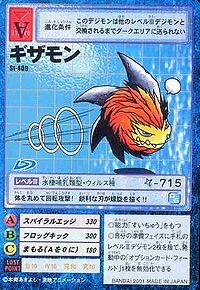 Its Special Move is coming at the opponent with its sharp, blade-like dorsal fin (Spiral Edge). | Giza comes from gizagiza (「ギザギザ」), meaning jagged. 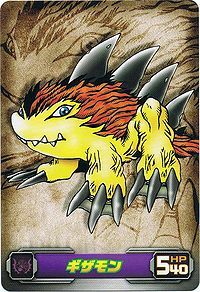 Anime/Manga Digimon Adventure: "The Fairy of Odaiba! Lilimon Blossoms"
Spiral Edge  スパイラルエッジ Supairu Ejji Spiral Saw Rolls into a ball and slices at the foe with the blades on its back. Frog Kick  フロッグキック Furoggu Kikku 4-Leg Kick/Frog Kick Jumps up and kicks out with its feet. Shoots a jet of water at the foe. A group of Gizamon served Vamdemon, but were eventually deleted by him and their data was used to make him evolve into Venom Vamdemon. Gizamon is an obtainable Digimon. 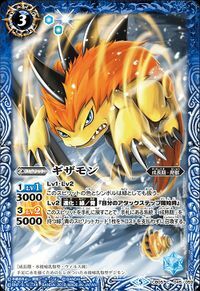 Can evolve to Cyclomon (0-2 DP), Deltamon (3-5 DP) or Devidramon (6+ DP). 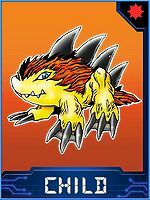 Gizamon appears as an obtainable Blue Card. Can be found at Sewage Tunnel. It can evolve to Hanumon if above level 22. He also gives you a request mission to obtain a Sticky Natto from Raremon at Junk Factory. Can be found at Angler Tunnel. Can evolve to Ice Devimon if above level 25 and Darkness EXP 350, or Raremon if above level 22, defense 90, and Machine EXP 440. Gizamon evolves from Nyaromon with 20 Aquan AP and evolves into Devidramon with 6 after battles, Seadramon with 20 Darkness AP, Shellmon with 20 Aquan AP or Gesomon with passing time. Gizamon is available as a Digimon Medal. Evolves from Pagumon. Can evolve to Devidramon, Tuskmon, Flymon, Deltamon or Raremon. 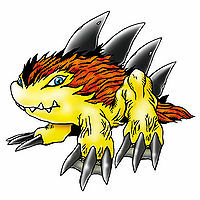 Gizamon is an enemy Digimon in Area 01 and 02. Evolves from Missimon. 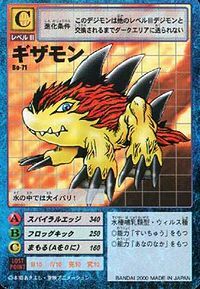 Can evolve to Meramon, Gekomon, Snimon or Dobermon. It curls its body into a ball and launches a spinning attack! Its sharp blades can carve spirals!! It is very proud in the water! It wraps itself in the water currents and does a tackle! The blades all over its body turn it into a spinning shuriken!! 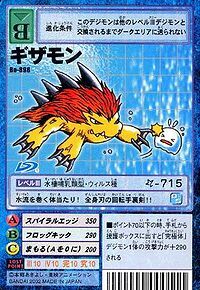 An Aquatic Mammal Digimon that grew fins on its hands and feet in order to paddle through water.